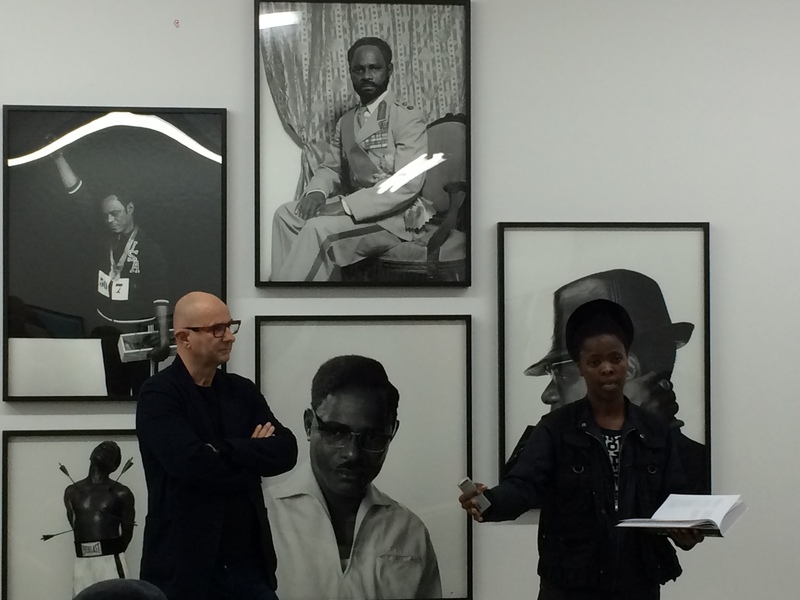 Where: Walther Collection, New York. 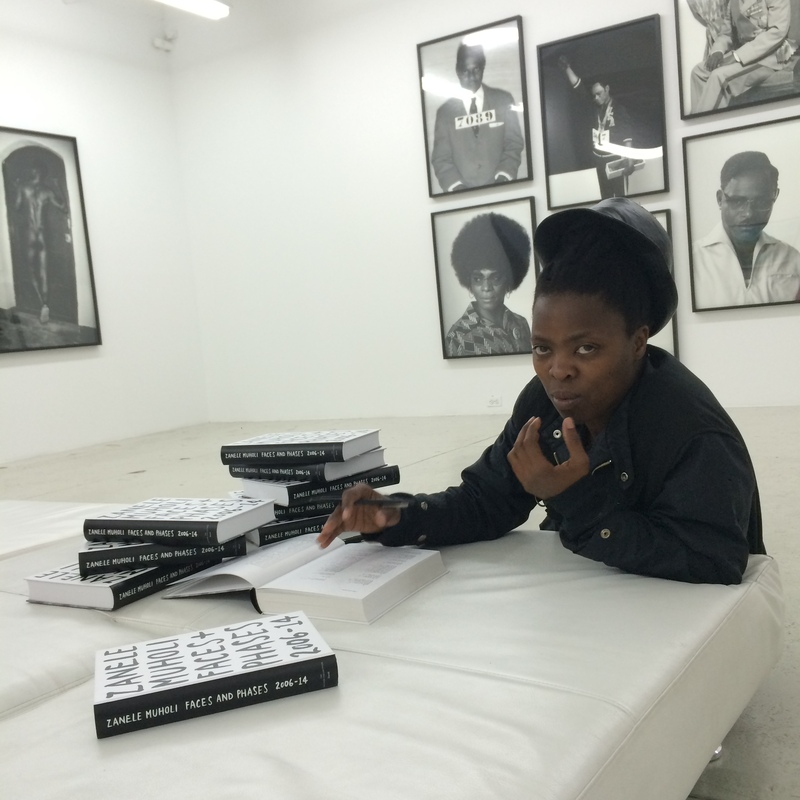 “You’ll have to read the book from back to front” said Zanele Muholi. 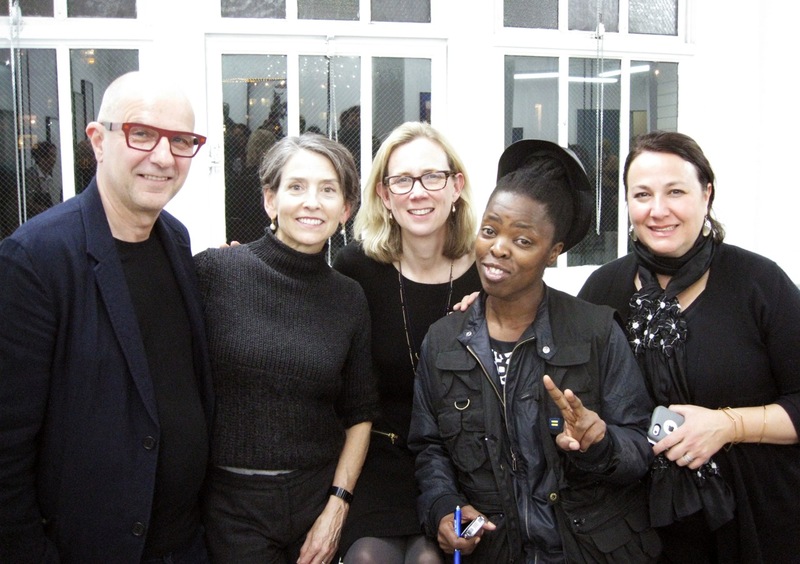 From L-R: Artur Walther (owner of Walther Collection), Yancey Richardson (owner of Yancey Richardson Gallery), Catherine Morris (Brooklyn Museum: Sackler Family Curator for the Elizabeth A. Sackler Center for Feminist Art), Zanele Muholi (photographer) and Judy Hecker (MoMA, Assistant Curator in Department of Prints and Illustrated Books). 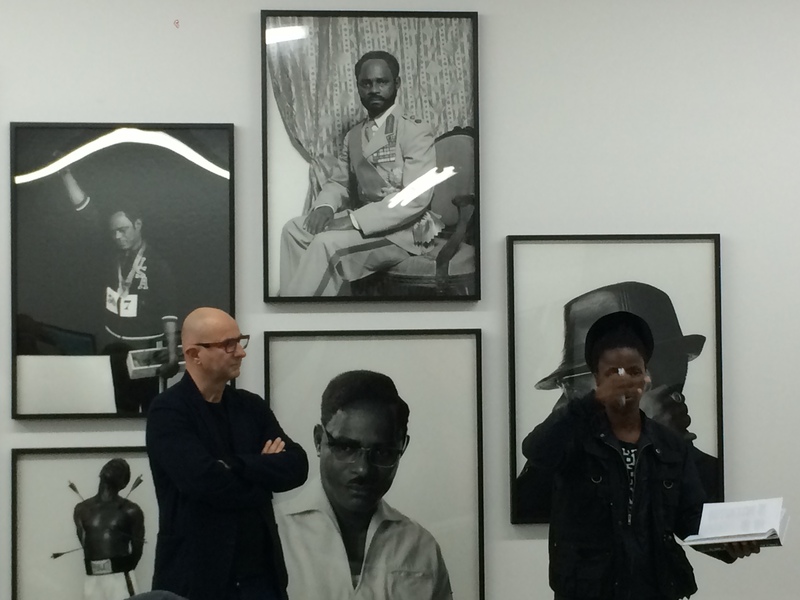 Muholi with Awam Amkpa (Prof. Tisch School of the Arts NYU) who co-initiated the Black Portraitures conference in 2013. 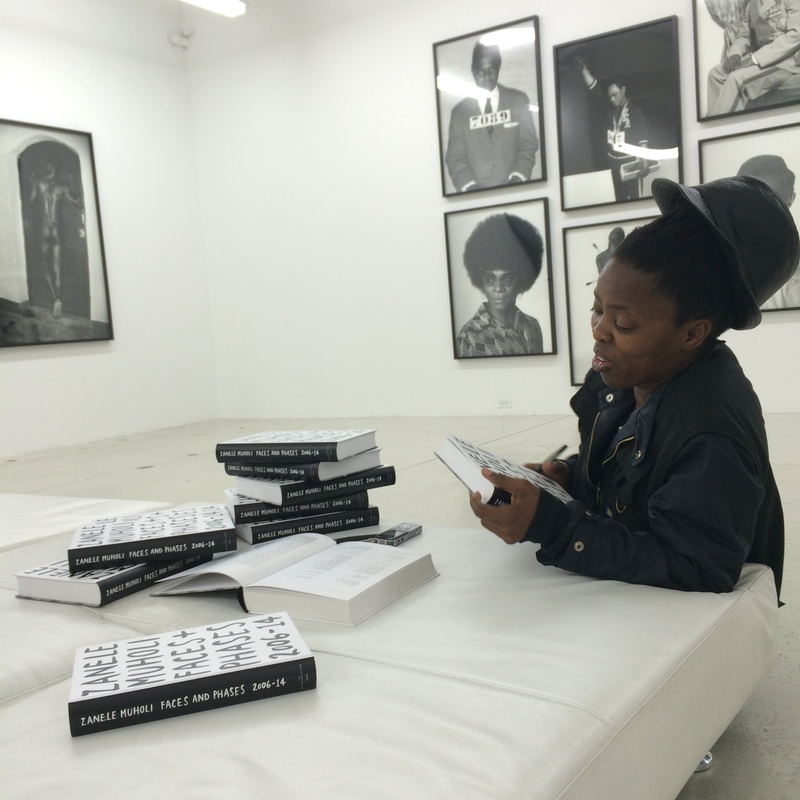 Contemplating… after the book was launched in this space and signing extra copies that Brendan Wattenberg requested me to sign. Am left here with 3 more individuals. Nomonde Mbusi, Brendan and Lola Flash is taking these memorable photos. Flash was born in the United States and is of African/Native American descent. 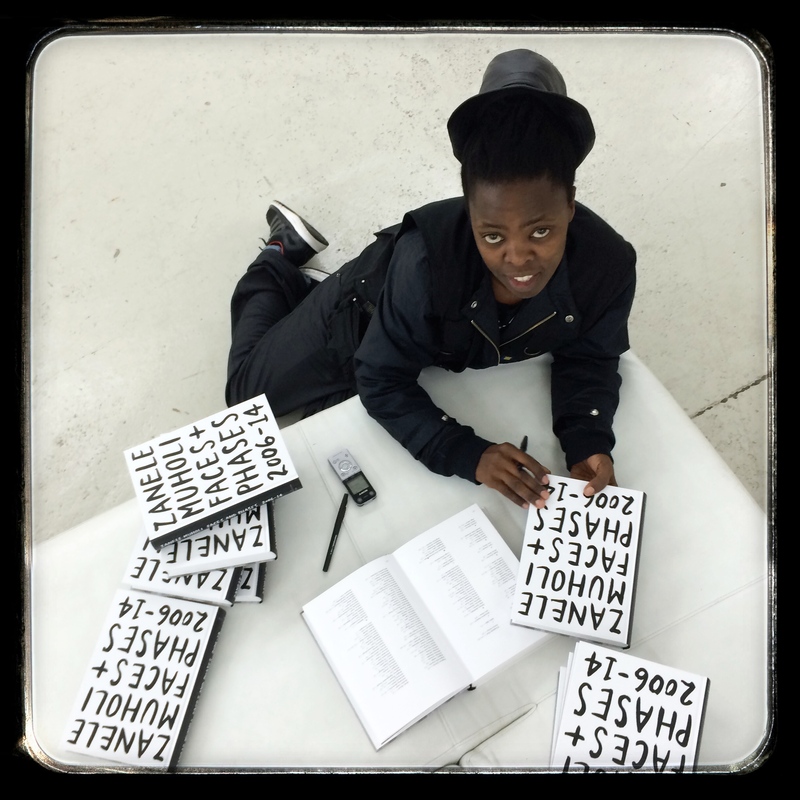 She spent 10yrs in London where she regularly exhibited her work and also attained her MA. A classic Flash photograph ‘Stay afloat, use a rubber’ is part of London’s Victoria and Albert Museum’s permanant collection. Her early work explored notions of colour, sexuality and gender. Her technique relied on the use of cross colour processing in the dark room, an effect which aided her confrontational and questioning style (see the miscellaneous gallery). Cassell publishing used several of these cross-colour works for a series of book covers. 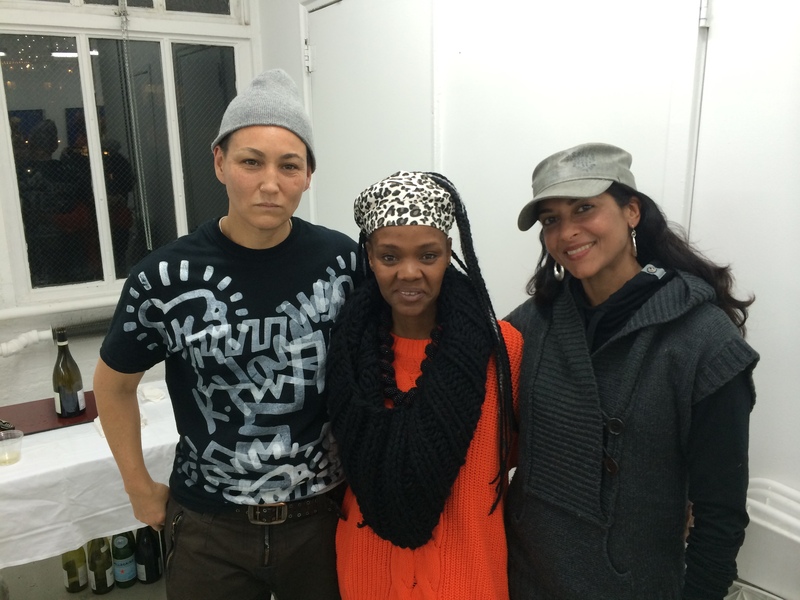 While still in London, Lola embarked on her [sur]passing series, inspired by tales of light skinned black people who would pass as ‘white’ during America’s period of segregation. 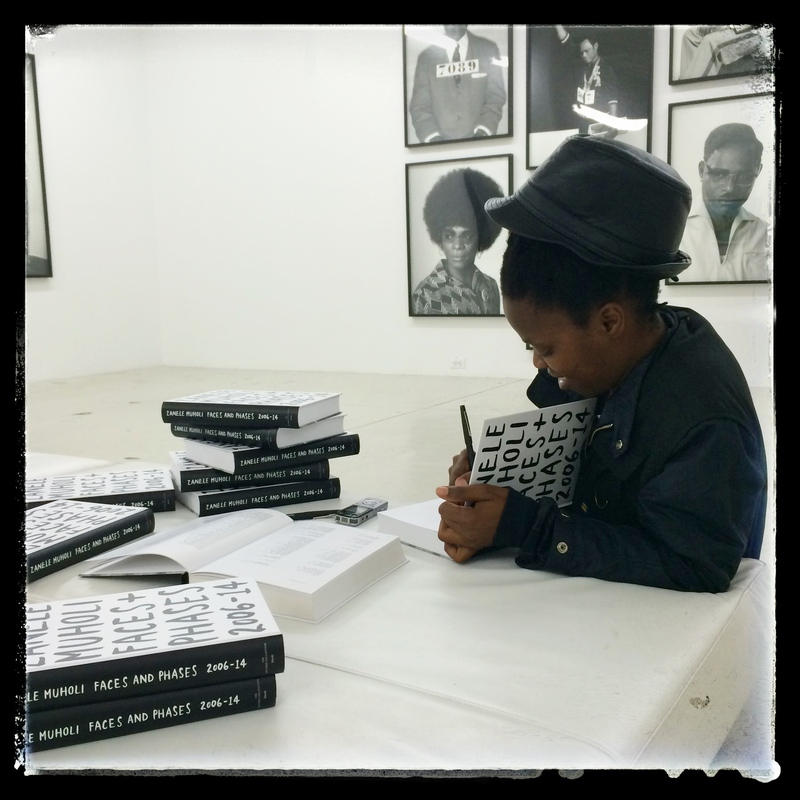 She expanded the notion of passing to include sexuality and gender. The series carried on after her return to New York where she followed it on with her later series surmise. Later works, quartet and scents of autumn, saw her move away from portraits and explore colour, light, decay, and what lies between. As can be seen in her new work, Lola is currently working on images unconstrained by theme. Lola is available for commissioned work. Lola is listed at autograph and en foco. 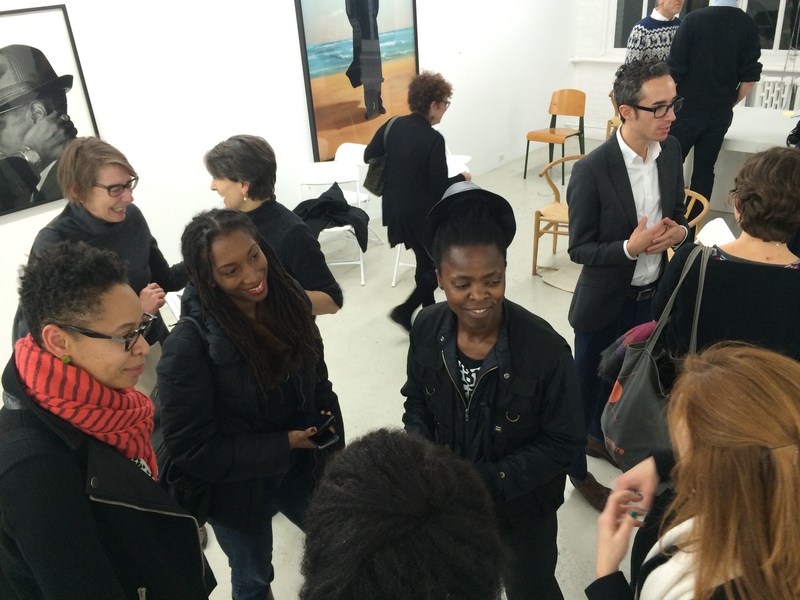 This entry was posted in Another Approach Is Possible, Art collectors, Article, Audience, Brooklyn Museum, Caring citizens, Claiming mainstream spaces, Cold night, Collaborations, Collective, Collectivism, Curators, Dedication, Dress sense, Education, Emotional support, Evidence, Excitement, Experience, Expertise, Exploration, Exposure, Expression, Faces & Phases portraits, Faces and Phases book launch in New York, Facing You, Fashion, Friendships, From Johannesburg to Paris to New York, Gallery owners, New York, Nomonde Mbusi, Portraiture series, Privilege, Professionals, Queer community, Queer Edutainment, Relationships, Representing, Self employed, Self love, Self recognition, Self-worth, Sexuality, South Africa, South African art, South African Artists, South African artists hit New York, South African lesbians, South African struggle, South African townships, South African traditions, South African Visible Arts, South African Visual Activism, Style, Teachings, Walther Collection, Warmth, We Are You, We Care, We love photographs, We Love Photography, We Still Can with/out Resources, We were (t)here, Winter in New York, Wishing you well, Witnesses, Zanele Muholi and tagged Act, Action, activism, Another approach is possible, Education, Experience, Feelings, Homosexuality, Human beings, human rights, Inkanyiso media, Living..., Love, Respect, Visual history, Visual history is a right, Voices. Bookmark the permalink. I am very proud of yet another extraordinary achievement by you. Keep going. …you are an inspiration to many and will never know how many lives you touch, safe and change…keep going!